1Department of Pharmacology Sapience Bio-analytical Research Lab. Indrapuri, Bhopal (M.P.) India. 2Department of Pharmacology, Truba Institute of Pharmacy, Karond, Gandhi Nagar Bypass Road, Bhopal (M.P.) India. 3Faculty of Pharmacy, Moradabad Educational Trust, Ram Ganga vihar, Civil lines, Moradabad (U.P.) India. 4Department of Pharmacology, NRI Institute of Pharmaceutical Sciences, SajjanSingh Nagar, Raisen Road, Bhopal (M.P.) India. Background: Cough variant asthma (CVA) is characterized by prolonged non productive cough which responds to bronchodilator therapy. None of herbal drug is reported to possess pharmacological activity against CVA. Objective: To investigate the pharmacological potential of ethanolic extract of Woodfordia fruticosa (L.) Kurz (EEWF) against CVA as well as to develop an efficient screening model for CVA. Material and Method: Anti-tussive effect of EEWF was evaluated against nebulized aqueous solution of 0.1 g/ml of citric acid to determine the cough response. EEWF potential was finally accessed against aerosolic mixture of 0.3 g/ml of citric acid mixed with 0.1% histamine and 2% acetylcholine chloride to evaluate the convulsive latency, percentage protection and cough frequency against CVA. Results: EEWF at aerosolic dose of 6% w/v exhibit decrease in of the average coughs frequency (4.83 ± 0.30) which is quite significant effect as compared to standard drug codeine. EEWF against aerosol induced CVA was found to exhibit a significant bronchoprotection of 41.75% and decreases number of coughs (7.16 ± 0.47) at 200 mg/kg as compared to control (14.16 ± 0.60). Conclusion: EEWF at 200 mg/kg dose exhibited bronchoprotective and anti-tussive effects against aerosol induced CVA. Keywords:Acetylcholine, Anti-tussive, Bronchoprotection, Citric acid, Cough, Cough variant asthma (CVA), Ethanolic extract of Woodfordia fruticosa (L.) Kurz (EEWF), Histamine. 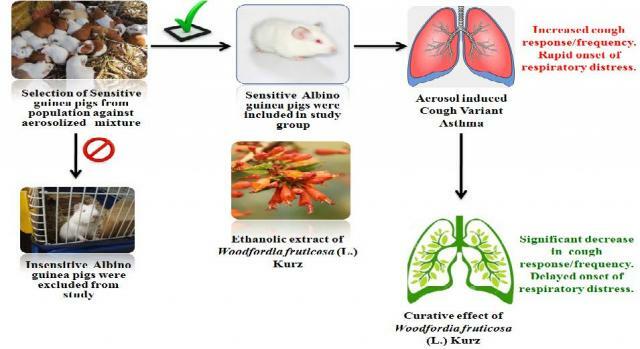 Srivastava AK, Siddharth SA, Hemant N, Rajnish S,, Gaurav S. Phytopharmacological evaluation of aerial parts of Woodfordia fruticosa (L.) Kurz in Cough Variant Asthma. Pharmacognosy Journal. 2015;7(5):296-299.